An "Oil Mature Fairway" has been interpreted which extends through PEL 37. Pancontinental believes that PEL 37 is well positioned in an oil generating "sweet spot" where oil prone source rocks are sufficiently buried to generate oil. A number of ponded turbidite, slope turbidite, basin floor turbidite fans and channels forming very large leads and prospects closely associated with, and within the Inner Graben of PEL 37 have been identified and mapped. Petroleum Exploration License No. 37 covers 17,295 km² (4.2 million acres) in water depths extending from <300m to 1,800m in the Walvis Basin offshore northern Namibia. Pancontinental and co-venturer Paragon were awarded the Exploration License on 28 June 2011 and a corresponding Petroleum Agreement was signed on 4 July 2011 (also effective 28 June 2011). Pancontinental increased its interest from 85% to 95% through a purchase of 10% from co-venturer Paragon in July 2012. 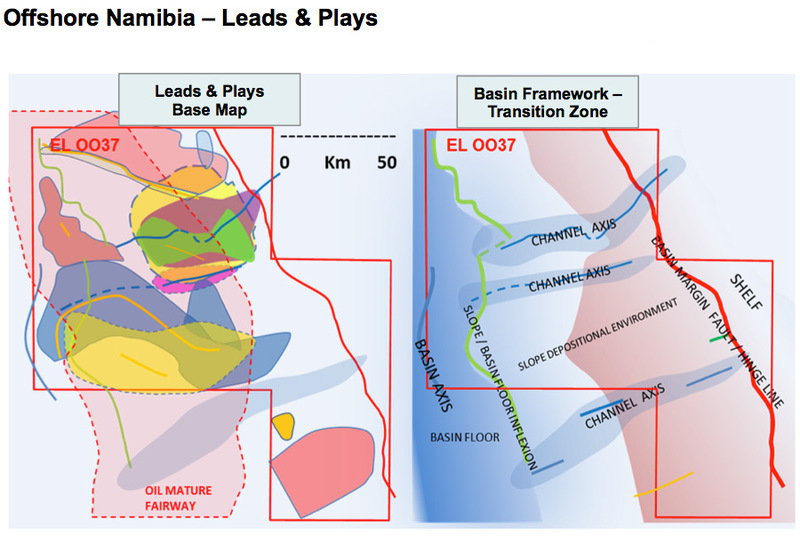 Pancontinental farmed out to Tullow Namibia Limited (a subsidiary of Tullow Oil plc) in September 2013, thereby reducing its interest to 30% and under conditions that will see it free carried through extensive 3D and 2D seismic programmes and an exploration well. 2017 Total farmin into Impact Block 2813a. In September 2017, Pancontinental and Africa Energy Corp. (“AEC”) closed negotiations with regard to AEC’s investment in the Company’s subsidiary that holds the Namibian asset, PEL 37. The deal worth US $7.7 million provides AEC with a 33.33% holding in the subsidiary, leaving Pancontinental with a majority interest of 66.67%. The first tranche payment of US $2.2 million was received at closing and a second payment of US $5.5 million will be due at the commencement of drilling the PEL 37 well which is anticipated during 2018. In December 2017, the PEL 37 approved an engineering plan and budget to drill an exploration well on the Cormorant Prospect by September 2018. The well commenced and was completed during September 2018. Although the well was dry, the drilling results will provide valuable information for future exploration in the area. Pancontinental believes that a critical factor for oil exploration offshore Namibia is oil maturity – where source rocks are sufficiently buried and heated to generate oil – within the “Oil Window”. Pancontinental has interpreted an “Oil Mature Fairway” that extends through PEL 37. Pancontinental believes that PEL 37 is one of the few areas covering an oil generating “sweet spot” where oil prone source rocks are sufficiently buried to generate oil; similar to its project offshore Kenya. Pancontinental is exploring ponded basin floor turbidites, slope fans and channels seen under the company’s earlier Reconnaissance Licence. These targets are associated with a restricted graben trough interpreted to hold the rich and mature oil source rocks indentified in regional wells. A number of the prospects exceed several hundred square kilometers in area based on current mapping, and detailed mapping will be undertaken to define the full extent of the structural and stratigraphic closures and potential oil-bearing traps. 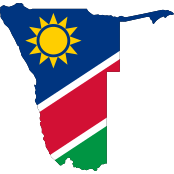 Offshore Namibia is continuing to attract significant international interest as an emerging oil and gas province in southwest Africa. The reservoirs interpreted by Tullow and Pancontinental in PEL 37; while they are interpreted to be closely associated with the interpreted source rocks, are also interpreted to be different and better developed than those drilled by HRT (now PetroRio). The Oil Mature Fairway and Inner Graben are asymmetric, with considerably larger “fetch” for oil generation and migration on the Eastern side of the Graben, covered by PEL 37. Crucially, the Oil Mature Fairway lies to the Eastern side of the axis of the Basin Floor and within the Eastern part of the Basin Floor and the Eastern Slope area. Oil migration is therefore interpreted to be predominantly to the East. Pancontinental therefore believes that the Eastern Flank is the environment that is most likely to contain volumes of trapped oil, and this is where PEL 37 is situated. Independent consulting firm DeGolyer and MacNaughton (“D&M”) had carried out an assessment of the oil and gas potential of the PEL 37 area. D&M provided estimates for 11 oil leads in the PEL 37 licence area of total mean prospective resources of 8.7 billion barrels of oil – (these volumes are not adjusted for geologic and/or economic risk). D&M are recognised as the leader in resource estimation for the petroleum industry and have extensive international experience with a diverse range of clients in a diverse range of regions, including onshore and offshore East and West Africa. D&M’s resource estimates recognise large stratigraphic leads in potential clastic turbidite targets. These targets appear to be in the oil window. 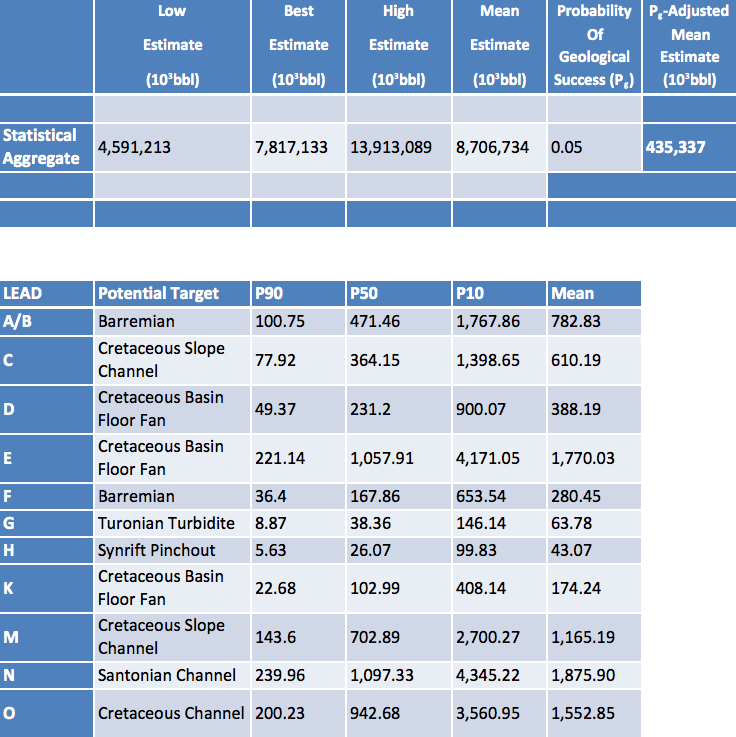 These potential accumulations are categorized as “leads” based on the available seismic and geologic data. The potential accumulations are not yet classified as “prospects” that are available for drilling. The summary potential volumetric findings of the report are reproduced in the Tables below as well as the details of each lead. 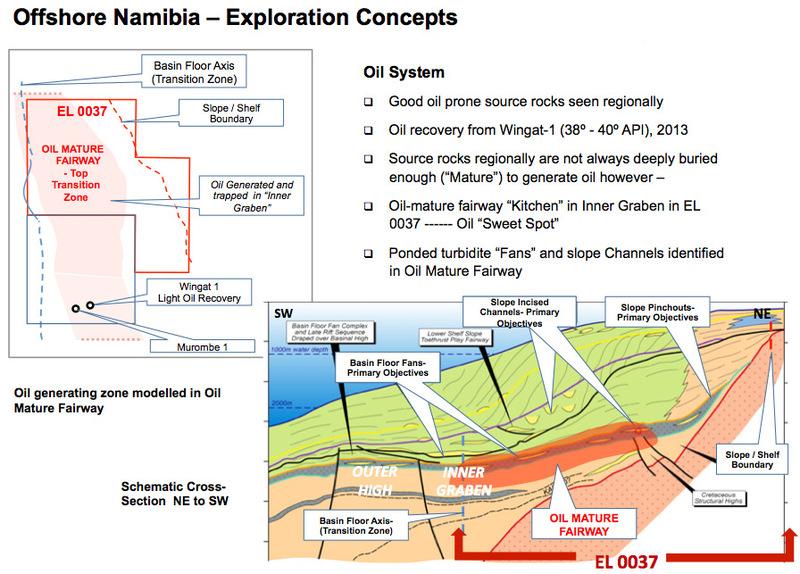 D&M has prepared the assessment of licence area EL 0037 offshore Namibia in accordance with the Petroleum Resources Management System (PRMS) approved by the Society of Petroleum Engineers, the World Petroleum Council, the American Association of Petroleum Geologists, and the Society of Petroleum Evaluation Engineers. D&M’s Mean Estimate for the total 11 Leads is 8.7 Billion Barrels of Gross Prospective (recoverable) Oil Resources. Low, best, high and mean estimates follow the PRMS guidelines for prospective resources. Low, best, high and mean estimates in this table are P90, P50, P10 and mean respectively. Pg is defined as the probability of discovering reservoirs which flow petroleum at a measurable rate. Application of any geological and economic chance factor does not equate to prospective resources to contingent resources or reserves. Recovery efficiency is applied to prospective resources in this table. There is no certainty that any portion of the prospective resources estimated herin will be discovered. If discovered, there is no certainty that it will be commercially viable to produce any portion of the prospective resources evaluated. Leads are features that are not sufficiently well defined to be drillable, and need further work and/or data. In general, Leads are significantly more risky than Prospects and therefore volumetrics estimates for Leads are only indicative of relative size. Operator Tullow Oil is a leading expert on and successful explorer of hydrocarbon systems along the West African margin. Tullow has mapped four key Prospects – Albatross, Petrel, Gannett and Seagull are Apto-Albian features mapped in close association with Source Rocks reported in the Wingat 1 well, 100km to the south. 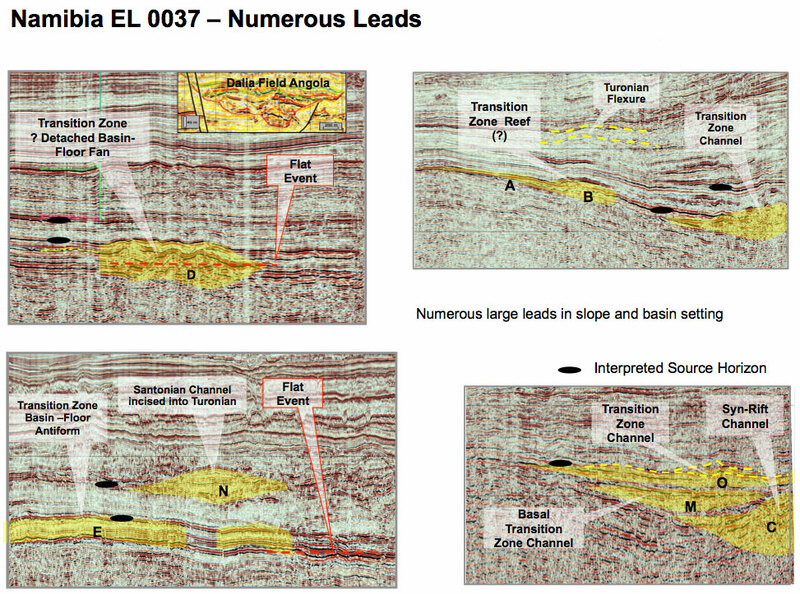 Apto-Albian source rocks are analysed to be thick and mature to generate oil in PEL 37 close to the Prospects. The four Prospects are Mass Flow or Turbidite “Fans” associated with seismic anomalies. Similar anomalies host very large oil and gas discoveries by Tullow (and others) elsewhere in Africa and beyond. In addition to the Apto-Albian Leads there are Barremian anomalies and numerous follow-up opportunities are available over the 17,000 km² of PEL 37.